Here is a recipe from my husband’s side of the family. As I may have mentioned before, my mother-in-law is an amazing cook. She found the inspiration for this recipe in a magazine when my husband was a baby. It’s evolved over the years into a family favorite, which my husband made for me for the very first time this week. Let’s just say, I’m a believer in Chicken Squares now. 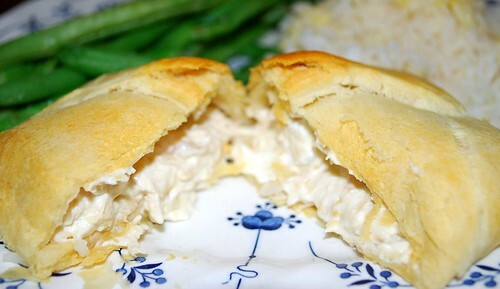 The crusty, flaky, buttery pastry opens to reveal a molten hot filling of creamy, cheesy, fragrant chicken. Be careful, because these little babies are addictively good. Preheat oven to 350 degrees. Apply cooking spray to a large baking sheet and set aside. Roll out the crescent dough and divide into rectangles, pinching the seam of the 2 triangles together to form oblong rectangles of dough. In a medium bowl, combine chicken, cream cheese, onion, Worcestershire sauce, and salt and pepper, creaming the ingredients together. Spoon a dollop of the chicken mixture onto one side of each crescent rectangle. Fold one end of the rectangle over the filling to form a square. 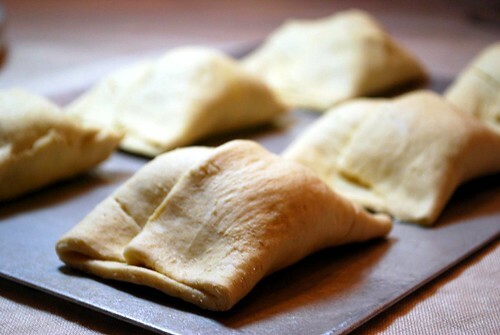 Pinch the dough together around the edges to seal, and place the squares on prepared sheet. 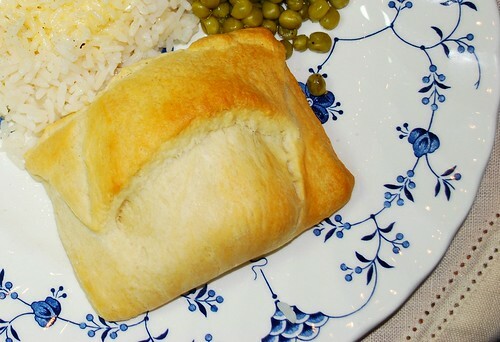 Bake the chicken squares for 20-25 minutes or until the crescent rolls are golden brown. 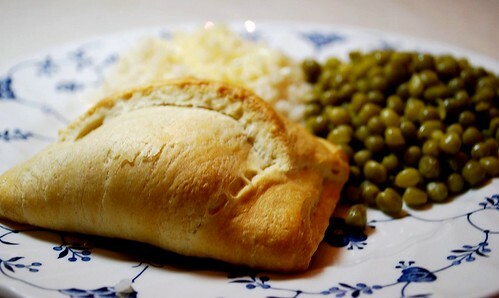 Serve immediately with rice and peas. Yield 6-8 chicken squares. Edit/Update: I have gotten so much great feedback on this post, that I wanted to share with you some of the variations and ideas I’ve heard about from readers who have experimented with it! The possibilities are endless!!! I’d love to hear what else you come up with, dear readers – I love hearing from you when you’ve tried my recipes. I especially enjoy hearing about how each reader adds their own creative tweak to these recipes! Feel free to post comments or to email me!